Timothy David "Tim" Minchin (born 7 October 1975) is a British-born Australian comedian, actor, and musician. 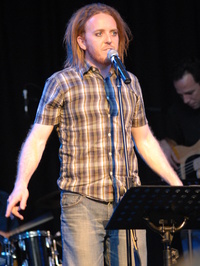 Minchin is best known for his musical comedy, which has featured six CDs, three DVDs and a number of live comedy shows that he performed internationally. He has also appeared on television in Australia, Britain and the United States. After growing up in Perth, Western Australia, he attended the University of Western Australia and WAAPA before moving to Melbourne in 2002. His breakout show, "Dark Side", launched him into the public eye, achieving critical success at the 2005 Melbourne International Comedy Festival and the 2005 Edinburgh Festival Fringe. In 2013, Minchin played the role of rock star Atticus Fetch on Showtime's Californication. This webpage uses material from the Wikipedia article "Tim_Minchin" and is licensed under the GNU Free Documentation License. Reality TV World is not responsible for any errors or omissions the Wikipedia article may contain.